Good Hotel Guide recommended 2019. Come and relax at the Rosemary in Falmouth, where we combine warm and friendly service, and a high standard of accommodation with a few luxuries. Perfectly situated on a quiet road between Gyllyngvase Beach and Falmouth town centre… Within walking distance of the Falmouth University Woodlane Campus and a short drive to Tremough Campus for the Universities of Falmouth and Exeter, The Rosemary is ideal for University Open Days and term time visits. 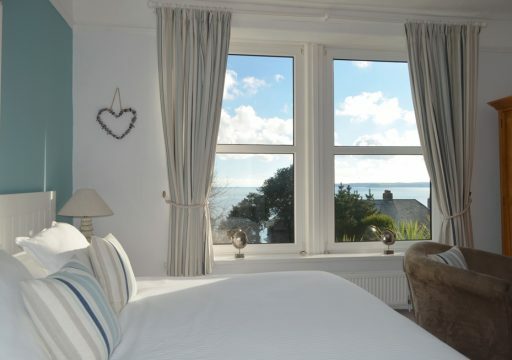 Our individually-designed rooms are comfortable and attractively styled, many with glorious views across the bay; each with flat screen digital television, free Superfast broadband, complimentary tea and coffee, hair dryer, bathrobes and luxurious toiletries from the Isles of Scilly and Cornwall. 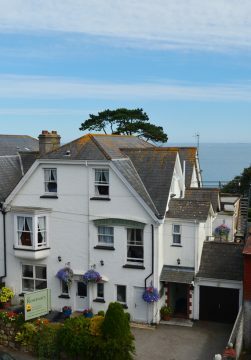 The house is set in delightful south-facing gardens, where you can unwind and admire the stunning sea views. Our spacious reception rooms are comfortable and welcoming and include a licensed Bar. Relax and enjoy Breakfast, freshly prepared with local ingredients in our dining room enjoying the view towards Falmouth Bay. We offer a full cooked Cornish breakfast as well as a wide selection of fruit, Cornish cheeses, pastries, cereals and local preserves. We cater for special diets too. The Rosemary is unsuitable for guests using wheelchairs. Guide dogs and well behaved pets welcome. Prices are a guide only and vary according to seasonal tariff. Superfast Broadband in all rooms. Superior en suite can also be booked as a king or twin room.